Babble – Multilingual WordPress Done Right! Take your WordPress website worldwide with Babble: the free, open-source translation framework built with VIPs in mind. Babble is based on familiar functions like custom post types, for maximum performance with minimum overhead. 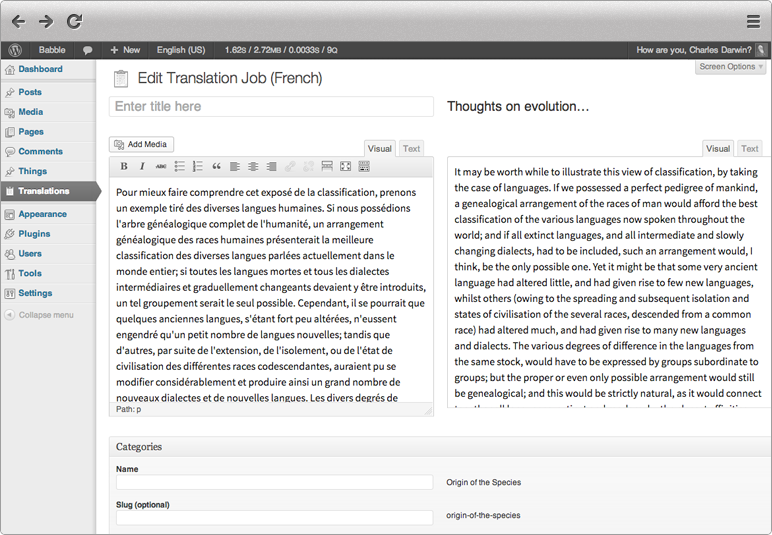 Babble puts everything a translator needs on the same screen, side by side. And because it's core WordPress, there's nothing new to learn. Babble tells your translators when a post is ready for their attention. And when the original is published, so are the translations. Babble was designed with performance in mind. In cold-cache tests it generates pages 20% faster than the leading premium plugin, and 40% fewer queries. Babble lets you run your website in as many languages as you want. Any script, any direction, no problem. Babble's lead developers are active contributors to the WordPress core platform. If you use WordPress, you're already using their code. When your translation is ready, mark it as Completed. Tell the world you now run a multilingual website! Babble comes with a host of API functions to help you create all kinds of multilingual functionality. Share your ideas and experiences with us on GitHub. All bug reports and pull requests welcome!